OTTAWA (CP) A federal study says smugglers may be switching tactics to take the bite out of their four-legged opponents –canny canines that sniff for illicit drugs plants and currency. The study also found that while the pooches are efficient members of Canada’s border units, more dog teams may be needed and the government should ensure they are optimally located. recommends an annual assessment be carried out to ensure “maximum coverage” of dog teams at high-risk ports. smells is 40 times greater than that of humans. Labrador retrievers and Beagles are the breeds of choice. Forty-six dogs focus on drugs and firearms . 19 seek out illicit food, plants and animals and four sniff for smuggled currency. dropped dramatically from $6.4 million in 2003-04. The study says that while seizures fluctuate year to year, one explanation for the dip is that two of the four currency detector teams were out of service for five months in 2005. 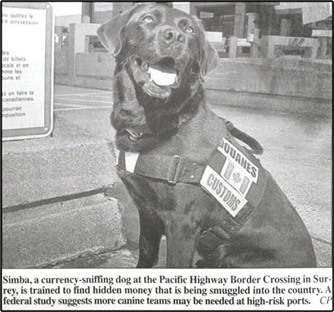 “It is also possible that money launderers are aware of CBSA use of detector dogs and have moved their smuggling activities to another ports” – a perception supported by dog handlers.